The coffins containing the remains of the six firemen who died during a rescue mission. MALAYSIA: Six Malaysian rescue divers drowned in a freak accident while searching for a boy who had gone missing in a pool at an abandoned tin mine, emergency officials said Thursday. The 17-year-old boy had gone missing Wednesday while fishing in the pool popular with anglers in the township of Puchong west of the capital Kuala Lumpur. 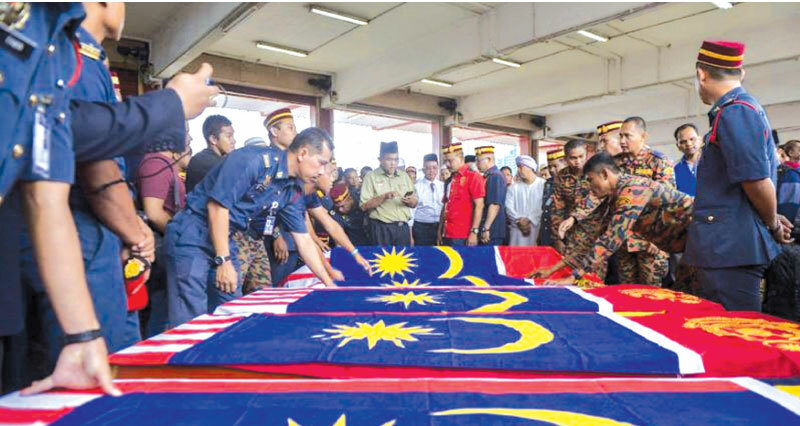 Mohammad Hamdan Wahid, fire and rescue department director-general, said the divers encountered strong undercurrents that spun them around in the murky water. Local police chief Abdul Aziz Ali said the spinning caused them to lose their diving gear. They were pulled out of the water after 30 minutes but by then they were already unconscious, he added.